Ronnie Estoque is the Editor-in-Chief of Cleveland Publications at Cleveland STEM High School. 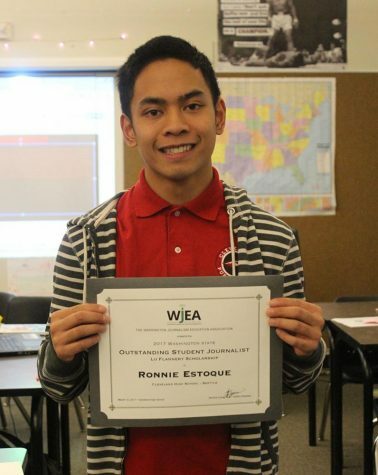 WJEA’s Lu Flannery Outstanding Journalist Award recognizes one Washington state senior who has made significant contributions to his/her journalism program. Applicant has made significant contributions to the school’s student media. *Three to seven work samples showing quality and diversity. Your portfolio should be submitted online. You may use any online tool to create and share your portfolio. JEA provides a nice YouTube tutorial listing some options HERE. Important note: The JEA video refers specifically to the Journalist of the Year portfolio. WJEA’s Lu Flannery Outstanding Journalist portfolio carries somewhat different content requirements. 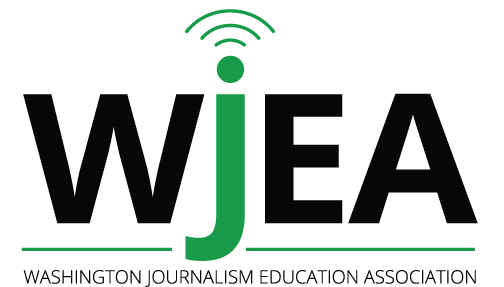 If you are also applying for WJEA’s Journalist of the Year award, make sure the portfolios are separate and the links to each are clear and submitted separately. Some ideas to help you with the self-evaluation (max 500 words): How do you feel about journalism? How did you get started in journalism? What have you had to go through to achieve success in journalism? What have you contributed to journalism? What are your journalism plans for the future? Samples of work should be carefully selected. Provide judges with a cross-section of your best work. Date, name of publication and description of relevance should be visible near sample. *Skilled and creative use of media content – writing, production, photography, etc. A panel of local professional journalists and educators evaluate entries. The scholarship of $2,000 goes to one winner. The winner will be announced March 11 at the WJEA Awards Banquet. The winner’s name will be published in e(MORE), WJEA’s e-newsletter, and on the WJEA Web site, www.wjea.org. The parent(s)/guardian(s), adviser and principal of the recipient will be notified and a press release will be sent to local media. 2005 Katie Weeks, Wapato H.S. 2004 Julian Sterbick-Myers, Wenatchee H.S. 2003 Katie Baumgartner, Inglemoor H.S.